A variety of social events take place every summer at Lawrence Park Tennis Club. Some feature a round robin as part of the fun, some give us a chance to catch up and relax with fellow members over refreshments. 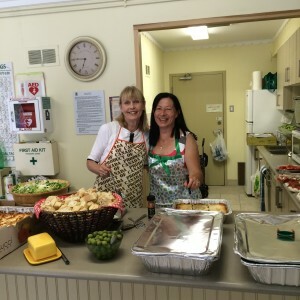 Members can look forward to regular social activities, including some dinners at the clubhouse, in addition to fun events to be held throughout the season. Times and dates of these events are shared on our calendar and, as they approach, through our LPTC member newsletter, “Between the Lines”. 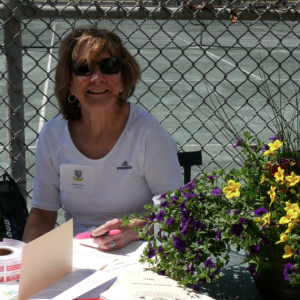 Any questions can be directed to our Social Director at Social@LawrenceParkTennisClub.ca. Click here for pictures from the day. We began last season with a new event – Wednesday clinics with our new pro. After Dinner Doubles will continue starting June 6th through the heart of the summer (subject to interest). An opportunity to drop down to the Club on Wednesday evenings to find a doubles game. 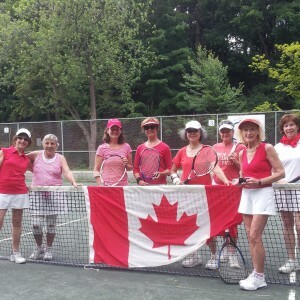 Canada Day Celebration–For one day only, members dig out red and white tennis attire and come down to the Club to celebrate our nation’s birthday. Wimbledon Strawberry Social & Round Robin—Come play, watch some of the action from the All England Club on the clubhouse TV, and enjoy traditional Wimbledon fare of treats, strawberries and cream. For those members who love beer tennis and pizza, join us for a fun evening!! Breakfast of Champions–Our popular event continued this year–on Sunday mornings for the final matches of each club championship event we enjoy some breakfast (bagels, cream cheese, coffee and tea) and watch the matches. Support your fellow members as they compete for the club championship trophies. All dates and times are subject to change (due to weather). End of Season Get-Together—Kick up your heels! Time to celebrate. What a fun end of season celebration and awards presentation on Saturday, November 10th. Pictures to come. Each of these events require volunteers to make them a success. We are looking for members who are willing to help in a variety of capacities, helping to set up for an event and/or clean up afterward. If you are willing to help out with one or more of our social events, please email Social@LawrenceParkTennisClub.ca.